I got up early this morning and I’ve been baking up a storm ever since. I decided to try my hand at making some real yeast bread dinner rolls. Low carb, obviously. I decided to go with the Carbquik Baking Mix for these rolls because it’s the closest thing to real flour that I’ve found so far. 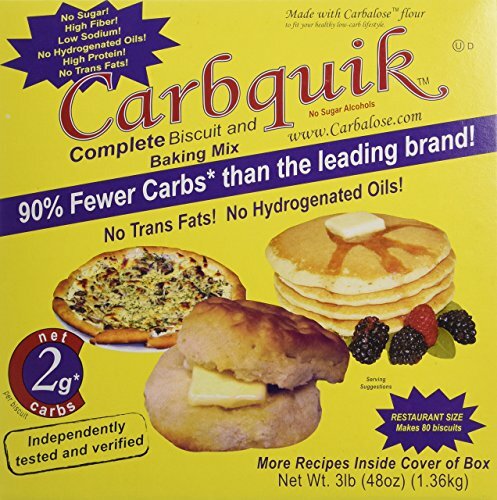 Carbquik is made from wheat, so it makes sense that it would behave the way that real flour does. I am not sure what kind of voodoo they work on the flour to make it low carb, but each 1/3 cup serving has only 2g net carb. Pretty impressive. Now, I like a sweet dinner roll, so I added in some sugar-free sweetener. And it worked out really well. The rolls have just a hint of sweetness. I should warn you though, you’ll see real sugar on the ingredient list, but don’t flip out. It’s something that the yeast needs in order for it to ferment properly. But all of the carbohydrate is consumed during the process. And at the end of the day, you’ll have a batch of tasty low carb dinner rolls with only 34 calories and 1g net carb each. Yep, these dinner rolls are real beauties. This recipe uses a combination of only water, yeast, sweetener and Carbquik Baking Mix to make real yeast bread dinner rolls with only 34 calories and 1g net carb each. 1. In a small bowl, mix sugar and yeast and dissolve in warm water. Set aside for 7 minutes until very bubbly. 2. Mix together Carbquik and sweetener in a medium sized bowl. Mix in yeast mixture with a wooden spoon until combined. 3. Add more Carbquik as needed until a kneadable dough forms. Knead dough for 7 minutes until smooth and elastic. 4. Preheat oven to 300 degrees F and get out a cookie sheet. 5. Cut the dough into 6 equal pieces. Form each piece into a ball and place on the cookie sheet an even distance apart. 6. Let the dough rest for 15 minutes. 7. Brush the tops of the rolls with melted butter. 8. Bake for 21-24 minutes until golden brown. In the middle of the cooking time, brush butter over the tops of the rolls again. 9. Cool on the pan for 10 minutes and then move to a cooling rack. If you liked this yeast bread, then you might be interested in my recipes for Rye Yeast Bread, Monkey Bread or Tomato Herb Focaccia. I calculated about 80 calories each (for 6 rolls) but still very delicious! These rolls turned out great. I used Stevia though because I can’t handle Swerve. Good. That sounds like a good substitution. Did stevia work with yeast? No, you need sugar to activate the yeast. But the sugar will be converted to alcohol and carbon dioxide in the fermentation process so the carbohydrates are cancelled out. Dina was talking and substituting Stevia for the Swerve that I used in the recipe. It’s just to sweeten the rolls to be more like normal non-low carb rolls.